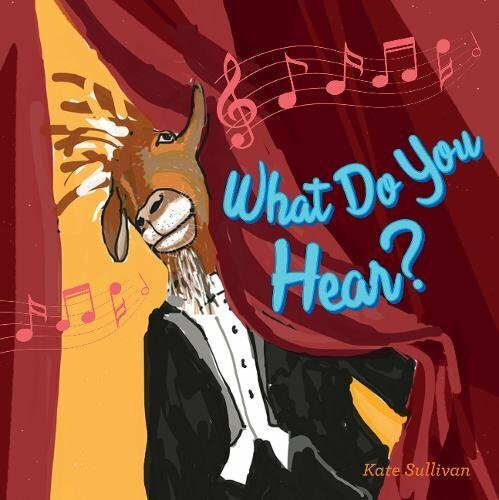 a book review by Carol Katz: What Do You Hear? The colors of the drawings are vibrant and kooky. For example, the rabbit playing the violin is wearing a green dress and high heels; the giraffe playing the bassoon is sitting on a bench, his long neck jutting out of a red sweater; and the lion playing the tuba is sitting on a chair, dressed in a black suit, his legs spread apart to accommodate the huge tuba. One can feel their movements as they blow or pluck strings. According to the author, “children will have fun learning about the instruments in an orchestra and the distinctive sounds they make.” However, it would have been better if a CD were included with the actual sounds of each instrument. On the other hand, young children do have fun making their own sounds. Also, it would have been better to have the animals on one side of the page and the instruments on the opposite side instead of on the next page. It would be easier to see both at the same time. Music teachers of young children will appreciate the book because of the quirky way the animals are dressed and the word plays: “thrummy-thrum,” “trip-a-lip,” “a-rumble-bumble.” Young children love to experiment with words and sounds. They could also have fun drawing their own animals with the instruments.